Common murres (Uria aalgee) are the most abundant seabird on the Oregon Coast. 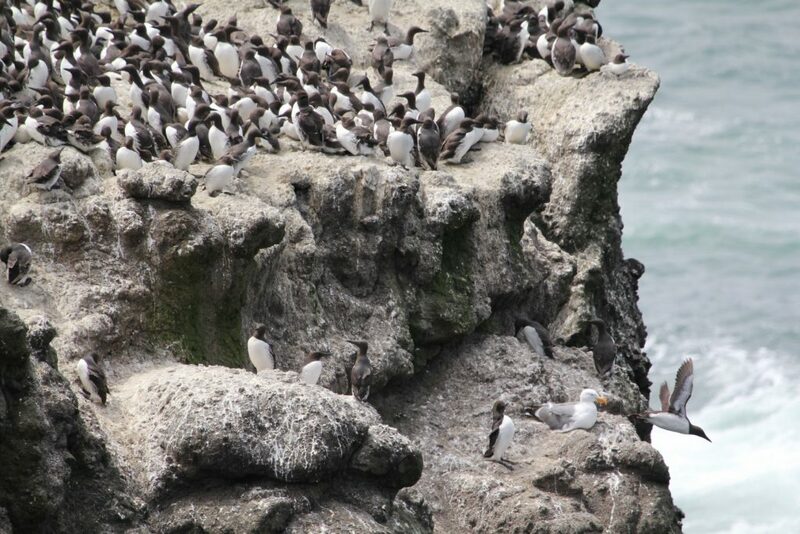 At least half of the population in the California Current Ecosystem breeds on the Oregon Coast (half a million seabirds). This makes them ecologically important consumers of forage fish, especially during the breeding season when they use state-waters. While they spend most of their time at sea, murres must come to shore to breed. During this time, they are highly visible by humans as they breed in large masses on rocky islands. While they are not the most agile on land, due to their short and stubby legs, they are actually amazing divers. Their short flipper-like wings help them swim, and they typically reach depths of 30-60m to catch their prey. Aside from their underwater aviation skills, they make great parents as well. Both parents will incubate and care for their chick – murres only lay one egg a year – until they fledge; once they leave the rock, male murres take full responsibility for their chicks while the moms go on vacation (they worked hard to lay the egg so they need some time to recuperate). After the breeding season, murres leave the rock in large quantities – this is often the last time humans will see them this year in large aggregations from shore. Despite their omnipresence and importance as a marine predator in Oregon, there is still a lot we don’t know about murres. Where do murres go when they are not breeding? Do they migrate? Where do they feed during the breeding and non-breeding period? What habitat characteristics are associated with feeding areas? By answering these questions, we increase knowledge of murre ecology in Oregon. Moreover, a more comprehensive understanding of the year-round movements of murres aids marine spatial planners take more informed actions on the current decisions regarding offshore renewable energy development. This is what I hope to achieve through my Masters research project at OSU. Most of what is known about the offshore distribution of murres in Oregon comes from vessel observations. However, vessel data only provide snapshots in time, and not a continuous picture of area-use. Within the Seabird Oceanography Lab (SOL), we are using individual satellite tracking devices to follow the movements of murres associated with the Yaquina Head colony, which is a prominent breeding colony in Oregon located near Newport. 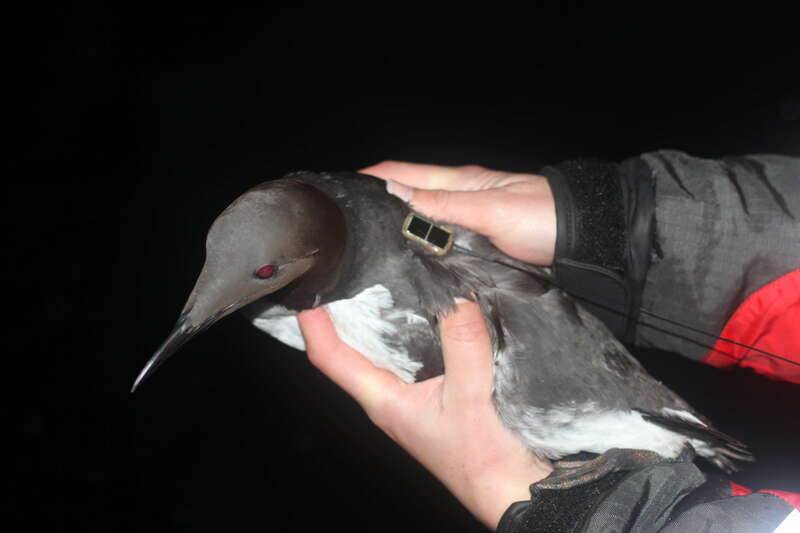 A common murre displaying a satellite tag prior to release. SOL was able to track 15 common murres associated with the Yaquina Head colony in 2015 and 2016. These tags were deployed periodically throughout the breeding period and have been successful in tracking birds for up to three months. Thus far, we have tracking data ranging from May to December (only one bird tracked during December). Tracking data from 2015 and 2016 of murres off the Yaquina Head colony provide an interesting comparison. In both years, murres experienced warmer ocean conditions, high Bald eagle disturbance rates, and consequently high Western gull egg predation at the colony. Some data also indicate low prey availability. The combination of all these factors is most likely the reason for the observed reproductive failure at the colony in both years. Tracking data showed that 13 of the 15 birds tagged dispersed from the colony earlier than expected. The maps below summarize the dispersal of birds by year and by time of deployment. Each map (Left: 2015, Right: 2016) illustrates all birds that dispersed from the colony and did not engage in central-place foraging (feeding trips to and from the colony). Sample size: n2015=7, n2016_spring=1, n2016_summer=3. Most birds made a northward movement and traveled as far north as British Columbia, Canada. Along their movement north, they used inlets and bays, but one of the most prominent areas used was the Columbia River plume. Birds used the Columbia River mouth area during the summer and fall, with the most time spent there during the summer. Dispersal from the colony was not what we expected; we expected individuals to breed on colony and engage in central-place foraging (feeding to and from the breeding site) nearshore until mid-August when they usually leave the rock. However, we are still interested in the habitat characteristics of feeding areas and the conditions that led to movement from one feeding area to the next. Prior to examining habitat associations of murre feeding areas, we must first determine their behavior state at each point location derived from the satellite tags. After data cleaning and filtering out erroneous locations, we applied a behavioral analysis (Residence in Space and Time method) to determine behaviors associated with each point location. This analysis has allowed us to distinguish between intensive foraging, transiting, and extensive foraging. Extensive foraging locations can be interpreted as a set of locations that are mostly spread out in space, where murres searched for prey. On the other hand, intensive foraging locations can be interpreted as a set of locations that are very close together in space where murres likely found prey, and thus spent more time. We are finalizing the extraction of environmental data for each point location from satellite data. Once all data are extracted, we can begin analysis for determining what environmental conditions were sought during dispersal and what types of habitats are preferred. Some of the ocean conditions that will be examined are sea surface temperate, wind, upwelling index, and primary net productivity. Some other habitat descriptors we are interested in assessing are substrate, distance to river mouth, salinity, depth, distance to the 200-m isobath, and distance to shore. For now, exploration of data indicates differences in habitat associations by behavior and between seasons. 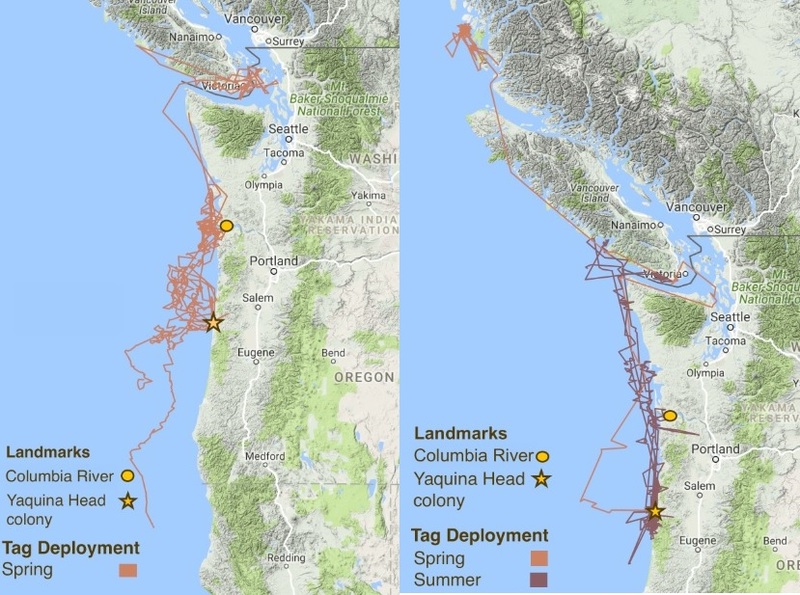 Sample size means everything in a study like this so I am happy to say that more data is yet to come: SOL plans to deploy 15 more tags during spring and summer of 2017. I am excited to see what the additional tagged murres will do, and whether they will follow a pattern similar to those tracked in 2015 and 2016. However this time around, we will deploy tags as late in the summer/early fall as we can, in hope of acquiring some novel winter data to fill this knowledge gap. If we are successful, we may finally have a better idea of what life is like for common murres during more of the year beyond the rock. more questions than answers I’m afraid:)! keep up the good work. Previous Previous post: Celebrating Hydrothermal Vents!